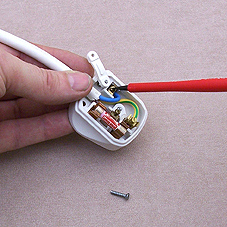 The key to a good job when changing a plug is to cut the cable to the correct size. 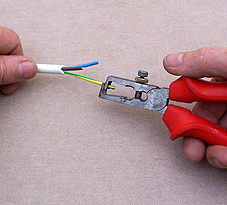 Strip the outer insulation of the wire by scoring it with a sharp knife being careful not to cut into the individual cable insulation. 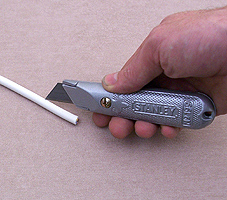 Strip 5 mm of cable from each cable and twist the ends so they will be easier to locate in the terminals. 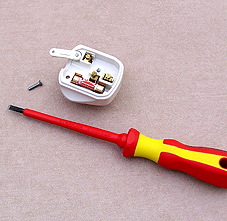 Unscrew the plug, loosen the terminals and loosen the strain relief. NB some plugs have a simpler push fit strain relief which is quicker as you simply force the cable onto it. Change a plug Top Tip You may find it easier to remove the terminals from the plug to make it easy to get the cables in. 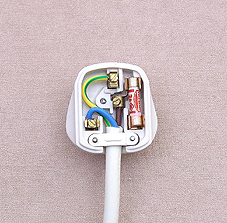 Place the cable in the terminals and tighten then back in the plug. The live (brown) is always by the fuse. Make sure the terminals are tight and there is no bare wire showing. Tighten up the strain relief so it clamps the outer insulation. 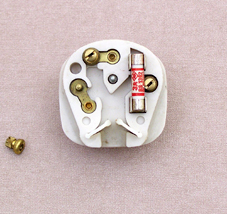 Screw the plug back together. 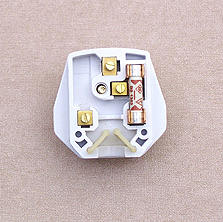 Plug with push fit strain relief. Make sure you cut the cable so the outer insulation is held firmly Plug with push fit strain relief AND more unusual terminals. The individual cables wrap around the terminal pillars and are held in place with a locking nut. You'll need to strip more from the insulation to be able to wrap the wide round.